Hello my lovely readers and finally welcome to the new post on my blog! I have already told you about school obligations I have through these last weeks of school (just three more weeks till the end!) and that kept me away from my blog for more than a week, I believe. How have you been? I hope you were and are doing well! 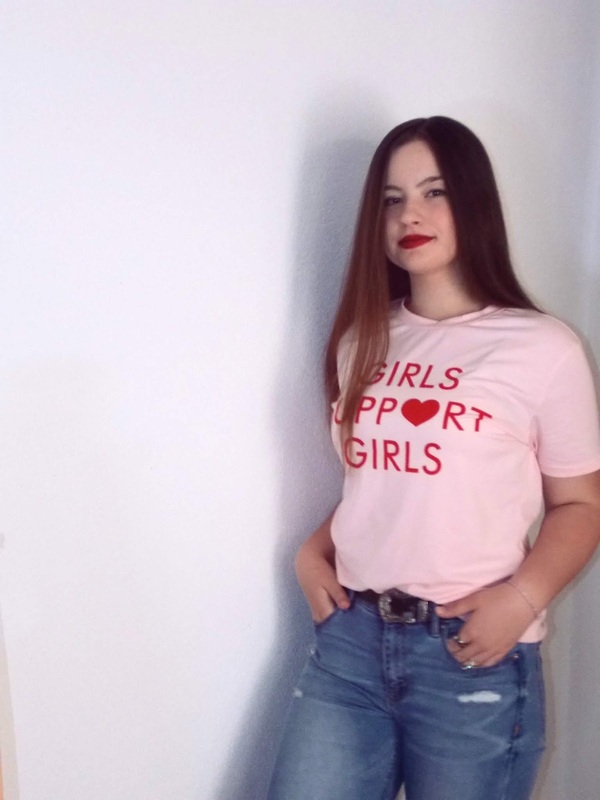 In today's post on my blog, I will share with you my review on a shirt I recently got from Zaful web shop. I think I have mentioned it in one of my wishlists before and it arrived to my house about two weeks ago but since I was busy, I have just now found the time to share my honest opinion about this Zaful piece! 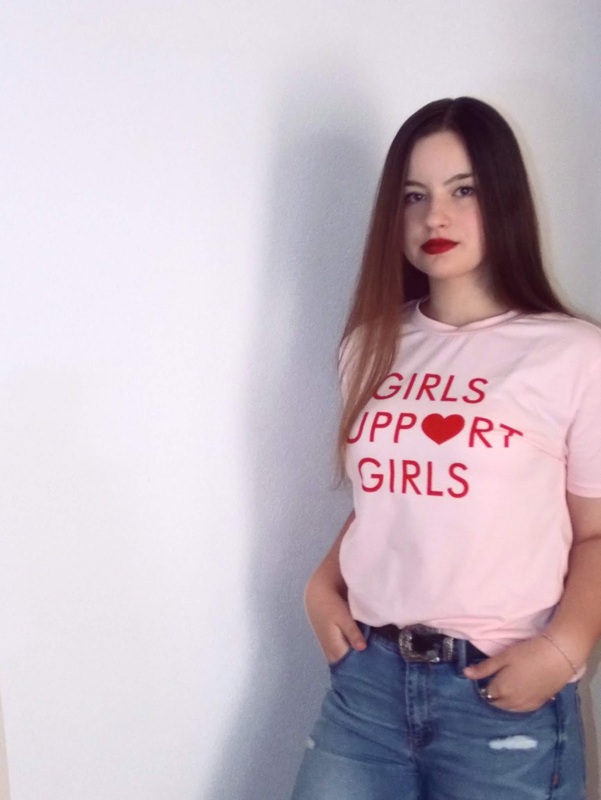 The letters on the shirt say ''GIRLS SUPPORT GIRLS'' and I have probably already mentioned it but it is highly important to stop seeing other women and girls as your competition. Rather see them as a motivation to be better, but to be better than you were yesterday, not than someone you are jealous of. Be inspiration to each other. Support each other. Let's start with the material. It's polyester and the material seems so nice! I really like it. The material is really good quality and also, the letters from the shirt won't fall out after a lot of laundering. and in size L (which fits US 8, normally US 8 fits M size). I like the T-shirts fitting loosely and to be a little bit longer so this one is great. The T-shirt is also available in multiple different colours, green, white and this pink, I think. Although it may sound silly, I was worried if it would came as it is shown on the product page because the T-shirt is tied on there and I was pleasantly surprised to see that it comes in the normal way. I really like this one and I would highly recommend you getting one for yourself. Zaful always keeps on pleasantly surprising me by the quality, uniqueness and style of their items so I can surely say it's one of my favourite web shops ever. This T-shirt is definitely worth checking out and you can find it HERE . That was it for this post! I hope you have enjoyed it! If you did, be sure to let me know down below. Ajme predivna majica, odlicno ti stoji! Bas je kjut! The phrase is beautiful but it's not true. I am always losing followers, they ask me to follow their blog and then cancel the follow up on my blog, of course that after some time it's impossible to know who it was. Women are false to each other. I agree with you, that we should inspire each other, but most women do not think so. By the way t-shirt is nice.